• Antibalas Afrobeat Orchestra – "The One Who Broke Your Heart"
• The Dap-Kings – "The One Who Broke Your Heart"
• Lenny Pickett – arrangement on "Weekend in the Dust"
• David Byrne & St. Vincent present their collaboration album, Love This Giant, recorded over two years, largely at Water Music in Hoboken, NJ. The album is a collaboration in the truest sense of the word, with Byrne and St. Vincent (aka Annie Clark) co-writing ten of the album's twelve tracks, and each artist penning one song individually. The album centers around an explosive brass band and is propelled by John Congleton's drum programming. • "There was no delineating what the roles were," explains Clark of the recording. "It's a collaboration I'm truly proud of." The duo also split lyrical and vocal duties on the record, which despite eschewing a traditional guitar/bass/drums lineup in favor of idiosyncratic horn arrangements, presents itself as infectious and modern hook-laden rock. • Byrne and Clark met in 2009 at the ‘Dark Was the Night’ benefit at Radio City Music Hall and were approached shortly after by the Housing Works Bookstore to collaborate on a night of music. They began composing remotely, trading song ideas and structures online while Clark toured and it quickly became apparent that they had more than just one night of music in them. Byrne performed with Clark at her ‘American Songbook’ show at Lincoln Center in 2010, and Clark contributed vocals to Byrne's 'Here Lies Love' album, released the same year. A perfect cerebral pop pairing: brass-led, but with a stylish, under-your-skin groove. 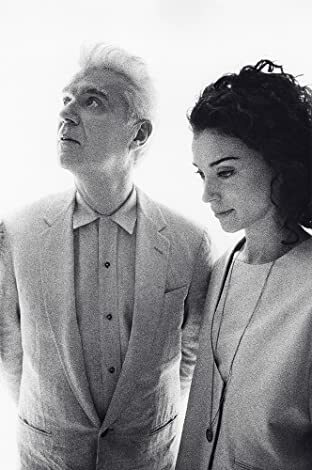 • The prospect of a collaboration between David Byrne and St Vincent’s Annie Clark is an enticing one. Byrne, one of the late 20th century’s most artful musical alchemists – from Talking Heads and on through his solo music, film, art and theatrical works – meets a woman feted as much for the ingenuity of her arrangements as for her swoon of a voice. Potentially, a perfect cerebral pop pairing, but has the end product lived up to expectations? • It would appear, wonderfully, so. Chiefly constructed around brass band instrumentation, the pair manages to avoid the staid conservatism that this might suggest, instead imbuing Weekend in the Dust, Dinner for Two and Lightning with a rhythmic slink that is more indebted to funk and afrobeat than it is to Sousa or a Colliery Band. Ice Age’s jerk-funk rhythms exemplify the stylish, under-your-skin groove that informs the whole album. • Combined with this is the pleasing combination of the two protagonists’ vocals. Although Byrne’s distinctive voice initially dominates, eventually the beauty and flexibility of Clark’s vocals, and their central role, are revealed. Offsetting his discursive, conversational style (“I took a walk down to the park today”), her singing switches between sultry and tuneful (Who) and reflective and floating (the wonderful Ice Age), providing wonderful harmonies that elevate both the song and the spirit ( I Am an Ape). • The album, despite having no obvious overarching theme or plot-line, nevertheless feels like an integrated conceptual piece. Creating alluring word-images, like The Forest Awakes’ perpetual motion, circle-of-life pictures (“A Song is a road / A road is a face”) or I Am an Ape’s mysterious “statue of the man who won the war”, the feeling is generally playful yet profound. A few tunes – Weekend in the Dust, Optimist, touching album closer Outside of Space & Time – would not sound out of place in a Broadway show. • Love This Giant improves and deepens on each listen. Byrne and Clark have managed to not only meet but exceed expectations, and created one of the year’s smartest albums in doing so. • David was born in Dumbarton, Scotland, to Tom and Emma Byrne. He was the elder of two children. Two years later, his parents moved to Hamilton, Ontario, and then to Arbutus, Maryland, when he was 8 or 9 years old. His father worked as an electronics engineer. 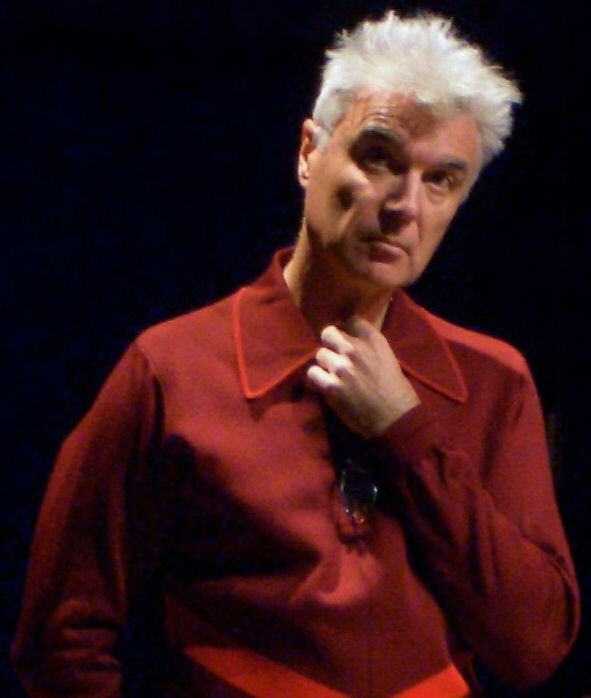 Before high school, David Byrne already knew how to play the guitar, accordion, and violin. He was rejected from his middle school’s choir because they claimed he was "off-key and too withdrawn." From a young age, he had a strong interest in music. His parents say that he would constantly play his phonograph from age three and he learned how to play the harmonica at age five. In his journals he says, "I was a peculiar young man — borderline Asperger's, I would guess." 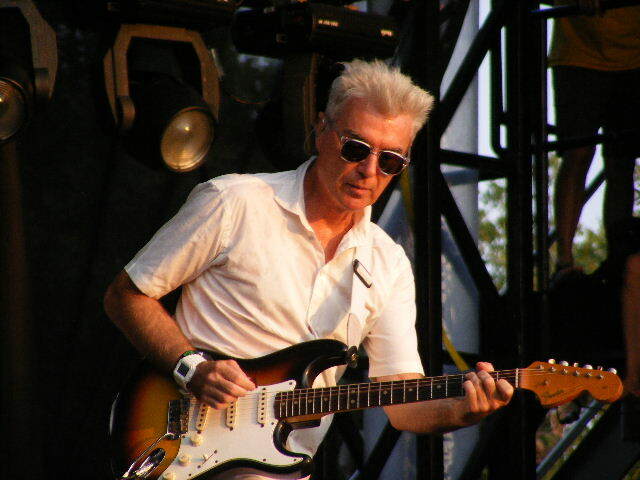 As revealed by Tina Weymouth in the commentary for the concert film Stop Making Sense, Byrne is left handed but plays guitar right handed. • While working on the film True Stories, Byrne met costume designer Adelle Lutz whom he married in 1987. They have a daughter, Malu Abeni Valentine Byrne, born in 1989. Byrne and Lutz divorced in 2004. Byrne began a relationship with the artist Cindy Sherman in 2007. • Although a resident of the United States since childhood, Byrne is a British citizen, and has never applied for U.S. citizenship. He lives in New York City. • Annie Clark was born in Tulsa, Oklahoma. She began playing the guitar at the age of 12 and, as a teenager, worked as the tour manager for her uncle's band Tuck & Patti. She grew up in Dallas, Texas, and attended Lake Highlands High School, graduating in 2001. • Following this, she went on to attend Berklee College of Music, before dropping out three years later. In retrospect, Clark said, "I think that with music school and art school, or school in any form, there has to be some system of grading and measurement. The things they can teach you are quantifiable. While all that is good and has its place, at some point you have to learn all you can and then forget everything that you learned in order to actually start making music." In 2003, during her time at Berklee, she released an EP with fellow students entitled Ratsliveonnoevilstar. While in Berklee, she worked with Heavy Rotation Records where "she revealed a much more private and intimate rendering of 'Count' for Dorm Sessions Vol. 1." Shortly after leaving Berklee, Clark returned home to Texas where she joined The Polyphonic Spree just before their embarking on a European tour. In 2004 she joined Glenn Branca's 100 guitar orchestra for the Queens performance. • Clark left The Polyphonic Spree and joined Sufjan Stevens' touring band in 2006, bringing with her a tour EP entitled Paris Is Burning. It contains three tracks, including a cover version of Jackson Browne's "These Days". • Clark's music has been noted for its wide array of instruments and arrangements, as well as its polysemous lyrics, which have been described as teetering between "happiness and madness". In response to this, Clark has said, "I like when things come out of nowhere and blindside you a little bit. I think any person who gets panic attacks or has an anxiety disorder can understand how things can all of a sudden turn very quickly. I think I'm sublimating that into the music." • In addition to guitar, Clark also plays bass, piano, organ, and theremin, and her music also often features violins, cellos, flutes, trumpets, clarinets, and other instruments. • Her unorthodox musical style has been characterized by critics as a mixture of chamber rock, pop, indie rock, and cabaret jazz. • As of late 2011, her pedal board includes the following: Korg PitchBlack, DBA Interstellar Overdriver Supreme, ZVex Mastotron Fuzz, Eventide Pitchfactor, Eventide Space, BOSS PS-5 Super Shifter, Moog EP-2 Expression Pedal. All her pedals are controlled by a MasterMind MIDI Foot Controller. She usually plays with a 1967 Harmony H-15V Bobkat guitar. © Photo of Annie Clark performing in Portland, Oregon on February 6, 2010 at the Douglas Fir Lounge.